Hollywood actor Rick Jason published his autobiography in July of 2000. After his death in October of that year, the book was pulled from distribution and is not available for sale. However, fans can freely enjoy his words via this online version of Scrapbooks of My Mind : A Hollywood Autobiography. I hope you enjoy reading Rick's life story in his own words. He was a remarkable personality who is dearly missed. 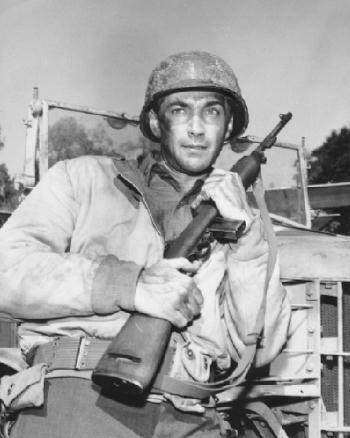 Star of television's longest-running World War II series, Combat!, Rick Jason conquered TV, theater, and movies in a career that spanned five decades. Providing an intimate look at Hollywood's star machine, Rick shares his unique perspective on MGM, 20th Century Fox and the other big Hollywood studios in their heydey. In Scrapbooks of My Mind, Rick Jason recounts with wit and humor his youth in Depression-era New York and his WWII army life, where he narrowly escaped spending life imprisoned at Leavenworth. From Broadway in the '40s to Hollywood in the '50s, Rick worked beside the stars of the day: Orson Welles, Jayne Mansfield, Joan Collins, Hume Cronyn, Linda Darnell, Ricardo Montalban, Charles Bronson, and more! He shares behind-the-scenes stories of his film and TV work, especially on Combat! with co-star Vic Morrow. A feast for fans, this autobiography captures Rick Jason's taste for life, as he even shares his favorite recipes. "Rick Jason has done it all, from stock to stage to screens large and small. Off camera, he is a terrific chef, world traveler, business entrepreneur, and happy man. He lives a colorful life and tells it very well." Is This Any Way to Run an Army?